CARFAX 1-Owner, Clean, L/ Certified, ONLY 18,363 Miles! EPA 28 MPG Hwy/22 MPG City! CD Player, iPod/MP3 Input, Satellite Radio, Dual Zone A/C, Keyless Start, Onboard Communications System, ACCESSORY PACKAGE 2, Back-Up Camera SEE MORE! Back-Up Camera, Turbocharged, Satellite Radio, iPod/MP3 Input, CD Player, Onboard Communications System, Aluminum Wheels, Keyless Start, Dual Zone A/C Rear Spoiler, MP3 Player, Privacy Glass, Keyless Entry, Child Safety Locks. ACCESSORY PACKAGE 2 Cargo Net, integrated storage pouch, Rear Bumper Protector, Carpet Cargo Mat, Alloy Wheel Locks, HEATED PERFORATED LEATHER TRIMMED STEERING WHEEL paddle shifters, F SPORT PACKAGE W/SUMMER TIRES Tires: P235/55R18 Summer. 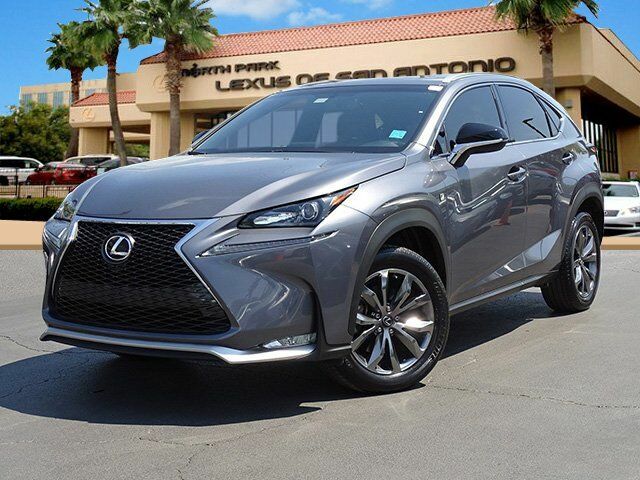 Lexus NX Turbo F Sport with Nebula Gray Pearl exterior and F Sport Black interior features a 4 Cylinder Engine with 235 HP at 4800 RPM*. Serviced here, Originally bought here, Maintenance Up To Date, 161 Point Inspected, CARFAX Certified One Owner, LOW MILES! Clean CarFax! Great color! Local Trade-in! Electronic Stability Control, Brake Assist, 4-Wheel ABS, Tire Pressure Monitoring System, 4-Wheel Disc Brakes Great Gas Mileage: 28 MPG Hwy. KBB.com explains "When a car's ride and handling fulfill the promises made by its flashy exterior, it's a win-win. In the 2017 Lexus NX 200t, a stellar reliability record adds a third win, making the NX the trifecta of excellence. ".